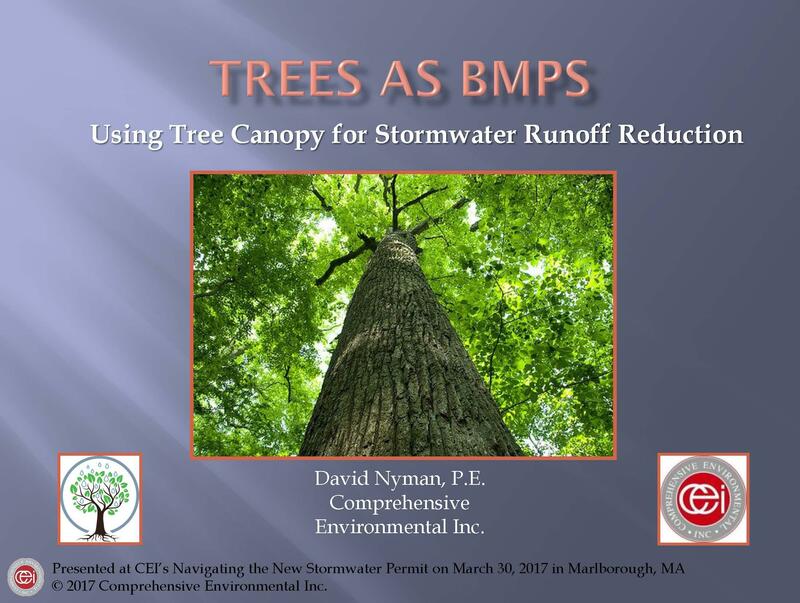 Click below to view the 'Trees as BMPs' project video and powerpoint presentation recently given at the Navigating the New Stormwater Permit, New Tools for Smooth Sailing Through MS4 Compliance conference on March 30, 2017 in Marlborough, MA. As part of the new permit, communities must develop a regulatory mechanism and accompanying regulations that in part address Low Impact Development (LID), street and parking lot design, and opportunities for implementation of Green Infrastructure. Through a project funded by EPA and MassDEP, CEI has compiled data showing the stormwater benefits of retaining or planting trees, as overhanging tree canopy can effectively reduce annual runoff from paved surfaces. CEI has also developed an innovative regulatory component, including a stormwater credit system, to promote the preservation and planting of trees. This presentation summarizes the study’s findings.